Simon wishes us to know that Kate’s daughters (Ellie and Laurie) and everybody at the Minster in Leeds will be very happy to welcome friends from choirs associated with Kate at the service this coming Friday. Dress: Gentlemen – jacket, collar and tie. Ladies – Kate LOVED scarves! IF YOU WOULD LIKE TO SING AT THE SERVICE PLEASE EMAIL SIMON ON lindleysimon@gmail.com BEFORE TUESDAY EVENING (26 JULY), IF POSSIBLE. We have been invited to support the singing in a service for Yorkshire Day on MONDAY 1 AUGUST 2016 in HALIFAX MINSTER. There will be a rehearsal at 10.00 am in Halifax Minster followed by the service at 11.00 which should last about an hour. We shall not be wearing concert dress but something appropriate for the occasion. Halifax Choral Society are contributing 10 voices. If you would like to take part in this event please let Carol know on 01484 723400. Veteran of almost a dozen major Overgate concerts over more than twenty years, and one of the finest singers of her generation, Kathryn Woodruff – whose life came to an end peacefully at home in Leeds on Sunday 10 July – was a regular visitor to our Calderdale venues of choice since her first appearance with us as the mezzo in Elijah in November 1993; she was to sing the same work with us in 2003 and 2013, bringing a wondrous combination of warm humanity and intense drama to the alto’s varied roles in this great work. Kate was also our alto of choice for the memorable account of Verdi’s Requiem presented a decade ago this autumn in the Victoria Theatre. 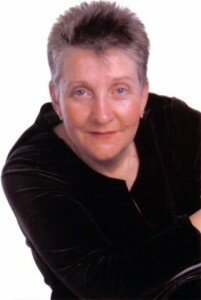 But she sang in much else too – Rossini’s Petite Messe Solennelle [October 1998 at Halifax Parish Church], Elgar’s Music Makers in 2007 at the same venue and particularly notably in John Rutter’s Feel the Spirit at Elland All Saints in October 2008. These were visionary performances in which her magnificent voice soared with a combination of effortless ease of control and an intensely emotive spirit. She came regularly to assist with Singing Days at Blackley and, whenever she visited and for whatever reason, she was invariably a hugely popular and welcome guest amongst us. Kathryn was easy of address and would talk to, and encourage, anyone and everyone. Her generosity of spirit shone through her musical artistry and her whole personality. We will miss her enormously and send our deep sympathy to her daughters Ellie and Laurie at this time. The funeral service is at 11.00 am in Leeds Minster on Friday 29 July. A new photograph of the Choir will be taken on WEDNESDAY 10 AUGUST at OVERGATE HOSPICE. Please meet on the drive at the Hospice at 6.15 wearing concert dress and carrying the music folder we use in concerts. After the photograph has been taken we shall go to St. Jude’s Parish Hall for a rehearsal (in concert dress). Please check this Members’ Area on Wednesday 10 August. If the photograph is postponed until Wednesday 17 August, due to inclement weather, a notice will be on this page.